The Chamber Orchestra "The Singing Strings" performance group is part of Evergreen School of Performing Arts and is comprised of students ranging in age from 7 - 14. The performance group sings in Finnish and Swedish and performs Scandinavian folk dances. 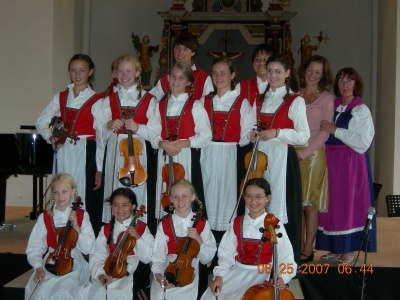 Many of the students have Scandinavian backgrounds and value the opportunity to share this culture/background with other young people through their concerts/performances. Numerous students have continued their education and pursued careers in international affairs, teaching, languages, music performance or international law. 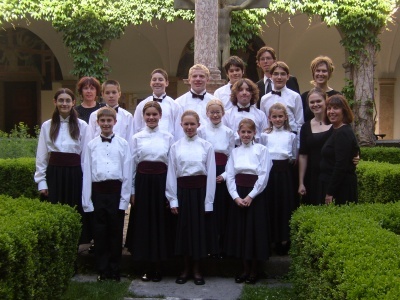 Through the years, "The Singing Strings" has developed into a highly professional group and has earned high praise from critics for their wonderful musicianship and joy of playing. Quoting the words of world famous violinist Isack Stern "Seldom have I heard so much joy in playing." Through its 24 years of existence, "The Singing Strings" has had the opportunity of numerous concert tours. They have performed in Russia, Finland, Sweden, Austria, Australia and the USA. Highlights were performances at the White House for Bill and Hillary Clinton, opening ceremonies of the Finnish Embassy in Washington D.C., Fourth of July celebration at the U.S. Embassy in Finland, Atlanta Olympics and Roots in Finland opening ceremonies. "The Singing Strings" have performed for 10 Finn-Fests, including in Los Angeles and are considered Good Will Ambassadors of American and Finnish cultures. In Minneapolis they have performed for Minnesota Orchestra's Summer-Fest concerts, Sibelius-Copland concert and during the visitation performance of the Lahti Orchestra from Finland.